One of the greatest “tests” of your mission’s relevance comes when you have important but controversial content to share. For entities like the Foster Youth Museum or The Dream Unfinished, this test is easy to pass. These institutions were formed explicitly with an advocacy function. Even as they present exhibitions or classical music, they do it in the hard-hitting context of the causes they advance. But for organizations without an explicit political function, it’s tough to present tough content. Every institution has some politics at its core—the politics of stewardship, or privacy, or care. Internally, we may pride ourselves on these values. Externally, on a few well-established political battles, like libraries fighting against censorship, we may feel confident speaking out. But for the most part, we struggle with what to share publicly and how far to go. We struggle internally with what we believe. And we stay silent, to our detriment. Being relevant means taking action—publicly—on the issues that matter to us and to our constituencies. Public advocacy work is good for business as well as for mission: a 2015 IMPACTS study of 48 leading US cultural institutions showed a 98% correlation between visitor perception of “delivering on mission” and financial metrics of success like fundraising ability and financial stability. Taking public action often means taking a small piece of the room, perhaps one that happens primarily behind the scenes, and building a new doorway for it. These doors, because they are political, can be hot to the touch. But for the right communities, they unlock meaning like no others will. The Monterey Bay Aquarium saw this firsthand when they started shifting overtly to being an advocacy organization. The Aquarium had always been a center for research and conservation work to protect endangered ocean habitats and the animals within them. But that work happened behind the fish tanks. In the front, visitors came, watched the jellyfish dance, and went home happy. In the 1990s, the Aquarium started sharing their conservation work more overtly with visitors. In 1997, they created an exhibit, Fishing for Solutions, about ocean conservation, the fishing industry, and the sustainable seafood movement. In conjunction with the exhibit, they started serving sustainable seafood in their café. Visitors started asking for a take-home version of the sustainable seafood list provided in the restaurant. Thus the Sustainable Seafood Watch campaign was born—a now-global pocket guide for people to make sustainable, environmentally-responsible choices when purchasing seafood. The Aquarium didn’t stop with seafood. Inspired by their visitors’ interest in advocacy, they kept building a message of positive action on behalf of the oceans across their activities. They invited visitors to write letters to Congress from the aquarium floor. They changed their mission statement to simply: “inspire the conservation of the oceans.” They continued to invest in conservation and advocacy work behind the scenes, and they got more and more confident sharing this work externally, through public exhibitions and programs as well as fundraising and policy change efforts. While the Monterey Bay Aquarium is a leader in this area, they are by no means the only aquarium with a conservation focus. Almost all zoos and aquaria have conservation missions. Look at their mission statements, and you will see powerful language about working to protect animals and their habitats. Zoos spend serious money on international research projects and serious efforts to change the fates of animals at risk. But here’s what Monterey does that others have been reticent to do: they make their conservation mission public. Most visitors have no idea that this work is happening at zoos and aquaria. I certainly didn’t—until I gave a talk at a conference for zoo and aquarium directors. Until that day, I had a vague sense of how conservation fit into zoos’ educational missions, but I didn’t realize the extent of the advocacy and activism happening across institutions. At that directors’ conference, we talked openly about the challenge of sharing this mission with visitors. Visitors to zoos want a warm fuzzy. A family outing. Pretty fish. Do they really want to be hit over the head with gloom and doom? This question belies a fear that the mission to conserve and protect species is not as relevant to people as the experiences on offer. On one level, this is probably true. Fewer people would come to a place called a zoo that solely presented exhibitions about the plight of the black-footed ferrets. People go to zoos to see “charismatic megafauna” – lions, tigers, and bears. It’s not unusual for a zoo or aquarium to plan an exhibition and specifically slot in a certain number of especially appealing species, just as a symphony conductor might include a “crowd pleaser” in each performance. But people do not visit zoos for cute animal antics alone. For decades, the debate about zoos’ role in society has flared—and not just in academic circles. By the time I was in middle school, my friends and I had strong opinions about the ethics of zoos. Zoos were relevant to us because we had visited with our families to see the elephants and pet the goats. As our political sensibilities awoke about many issues that touch zoos— humans’ role on our planet, habitat destruction, overpopulation, climate change—we wanted to apply our newfound interests to sites familiar to us, including zoos. We weren’t ready to talk about what should happen on the African steppes far from our lives. But we were ready to talk about whether African elephants should be in our zoo, and whether that was a good thing, or bad. And so we had the choice: to reject zoos or to embrace them, or somewhere in-between. Put yourself in the shoes of a zoo director. Wouldn’t you want to influence this choice? To invite those twelve-year-olds into a room where you could discuss these important issues? It seems short-sighted—both from a mission and business perspective—to abscond the opportunity to demonstrate a new layer of relevance in areas where zoos exhibit real leadership. 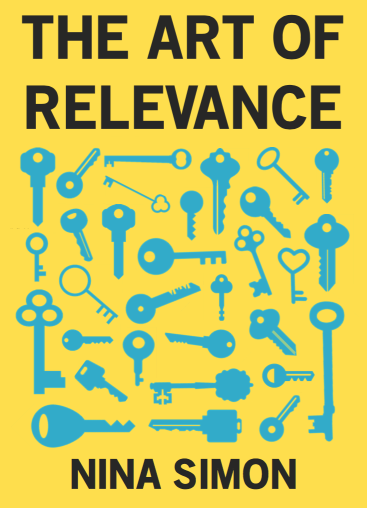 Why not build relevance in a sphere deeply connected to your mission? This isn’t just a question for zoo directors. Many of our institutions deal directly with universal human controversies and political questions. Art museums deal with questions of repatriation and who should own the cultural heritage of the past. Theaters ask how we should dramatize the stories that matter to us. Historic sites address the battles fought and victors anointed in our collective past. Educational programs try to rebalance systemic inequities in privilege and opportunity. With the exception of some religious and social justice institutions for whom activism is in the blood, many organizations shy away from directly addressing these big questions. They are polarizing. They are political. They could “distract” our participants from the experience they came to have. But big issues are often the most meaningful things our institutions have to offer. They are doors to the heart of our work. To keep those doors closed is to avoid the opportunity to unlock political meaning and personal value. When we stick with the charismatic animals, we stay in the realm of the exotic, the foreign, the spectacle. When we relate those animals to issues that matter to us individually and collectively, our institutions gain relevance and value. Sometimes our machinations to avoid the big questions damage our credibility along with our relevance. When curator Michelle Zupan chaperoned a group of high school students on a trip to the historic Isaiah Davenport House in Savannah, Georgia, the teens noticed something odd. While an exhibit panel named the slaves who worked in the 1820 home, the tour guide constantly used the word “servant” to refer to them. Finally, one of the African-American students stopped the guide and asked, “do you mean slave or were they paid?” The guide replied that they were enslaved, but that she was told not to use the word “slave” because it would offend people. The students were very quiet and distracted for the rest of the tour. When they all sat down later, they exploded at Michelle about this “white-washed history,” and wanted to know if this was how it was done everywhere. These kids were 16, 17, and 18 years old. They were ready to have an honest encounter with history. But the dishonesty of the tour cut them out of it. It destroyed the opportunity for relevance, for value, and frankly, for education in a site purportedly committed to history. Sometimes they will. But often they won’t. The art doesn’t speak for itself in every language. The archives are buried. The fish are dying far from here. If you want people to care, if you want to matter more, you have to take the risk and make the relevance explicit.